Have you ever wished that making a cup of tea was as easy as Febreezing the couch after your cat puked on it? If so, first of all, you need to get out more, but second, your dreams have come true! 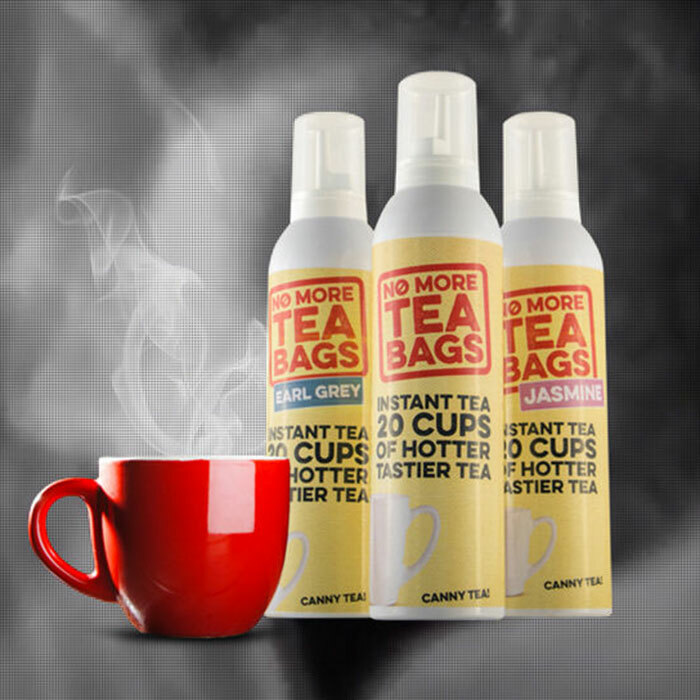 A company in the UK called Yum Cha Drinks has released a product called No More Tea Bags – a “Liquid Instant Tea” that comes in an aerosol can. On its website, the product promises: “Makes 20 cups of hotter, tastier tea. No soggy tea bags, no messy leaves and no waiting for your cuppa to brew.” All tea lovers need to do is shoot the pre-brewed tea concentrate out of the aerosol canister into a cup and add hot water. Voila. You instantly have maybe a cup of tea. As an added bonus, the brand promises you can “easily control the strength of your tea” depending on how heavy-handed you are with the aerosol spray. Of course, releasing such a product in the UK is a bit of a double-edged sword. The Brits drink far more tea than us Yankees do, so the market is certainly there. However, people in the UK also take their tea very seriously, meaning a backlash to a bizarre canned tea concentrate was probably inevitable. Still, No More Tea Bags is here whether people want it or not. And if the product’s online shop is to be believed, someone wants it because the three bottle “Selection Pack” featuring Breakfast, Jasmine and Earl Grey tea is currently listed as sold out – though you can still grab individual bottles for £5.95.